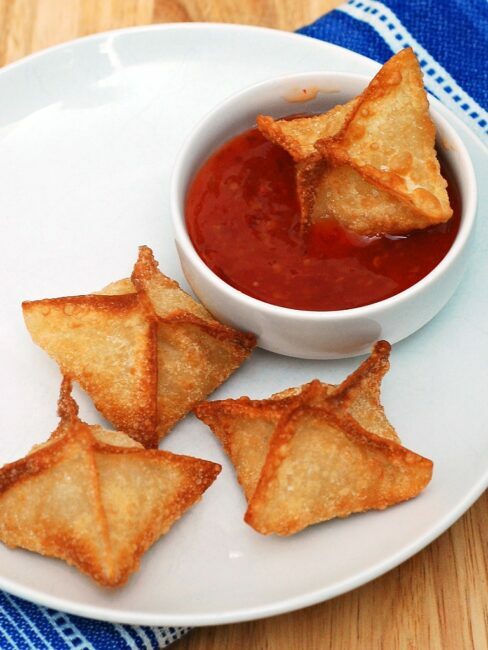 Crab rangoon is a deep-fried crabmeat appetizer popularized by the Polynesian-themed restaurant Trader Vic’s in the 1950s. Say goodbye to the show Mad Men with this dish mentioned on the show. It’s the end of an era. On Sunday, the final episode of Mad Men will air, and it will be over. If you’re unfamiliar with the show, it’s a drama set in the 1960s about Madison Avenue advertisers. You need to see it, not just to drool over Jon Hamm, but because it’s a show worth watching. It won 15 Emmys and 4 Golden Globes in the time it’s been on the air. I joined up with several other bloggers and the authors of The Unofficial Mad Men Cookbook, Judy Gelman and Peter Zheutlin, to send the show off in style. We’re sharing recipes for dishes popular in the era of Mad Men, and featured on the show. I knew that I would make crab rangoon as soon as Judy contacted me about the event. I love crab rangoon. Wait, back up. I love GOOD crab rangoon. Unfortunately, good crab rangoon seems to be hard to get around here. It’s either mushy or bland. Or worse, both. 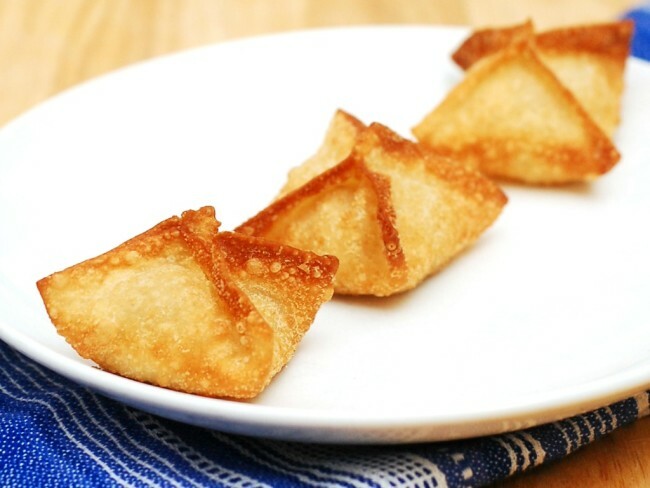 Basic crab rangoon is crabmeat and cream cheese, wrapped inside a wonton wrapper and fried. Good crab rangoon includes garlic and onion, Worcestershire or soy sauce, and for the love of god, salt and pepper. Is salt and pepper too much to ask for?? Sorry. Calming down. Serve these appetizers hot with a dipping sauce. My favorite is sweet Thai chili sauce, found in the international aisle of your local grocery store. Pour oil into a heavy saucepan or Dutch oven to a depth of three inches. Heat over medium-high heat to 350 degrees. Reduce heat to low to maintain temperature. While oil is heating, in a small mixing bowl, combine crab meat, cream cheese, garlic, Worcestershire sauce, salt and pepper. 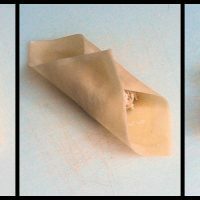 Spoon filling by the teaspoonful into the center of each wonton wrapper. Moisten all four edges of the wrapper with water, and fold opposite edges up and pinch. Fold the remaining two corners up and seal all edges together. Repeat with remaining filling and wrappers. Prepare a baking sheet: line with two to three layers of paper towel, and set a wire mesh cooling rack on top. Place near the stove. Once oil reaches 350 degrees. fry the filled wontons in batches of four until golden brown (about 20 to 30 seconds), flip and fry until golden brown all over (about another 10 to 20 seconds). Remove with a slotted spoon to the cooling rack and season immediately with salt. Repeat with the remaining wonton wrappers. Once cool enough to handle, serve with soy sauce, duck sauce or sweet Thai chili sauce. I have not watched the show. I tend to wait until they go off the air and then binge watch to see what I’ve been missing. Case in point? I just finished crying through the last episode of Parenthood. :p SO… I plan on making some atomic age cocktails and apps… sitting down…and binge watching all the way through. Also planning on having these on a plate next to me. They look crazy good. I am loving all these Mad Men inspired recipes lately! but I have to say, this may be my favorite yet! I adore crab rangoon with every fiber of my being. I’m planning on binge watching the show. I tend to wait till things are off the air and then Netflix binge. And I love these crab wangoons. They look amazing! One of my all-time favorite appetizers…sounds delicious! 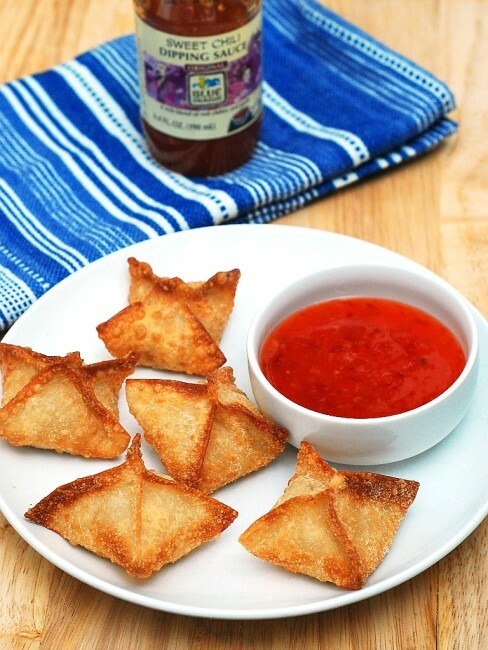 Your wontons look absolutely perfect, Coleen! Even though I haven’t been watching Mad Men, I love that whole era. And I love these crab rangoons even more! I don’t watch Mad Men…but, I definitely enjoy Crab Ragoons. These look delicious! You know, I’ve always liked Crab Rangoon and I’ve been meaning to learn how to make it! Crab rangoon is one of my FAVES! And I too am a Mad Men fan! LOVE their outfits!